What’s your favourite smurf in your collection? 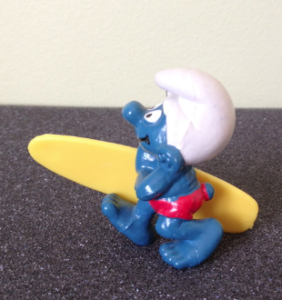 Not surprising to most, I have more than one but as the temperature rises this Summer I have to say Surfer Smurf, first released back in 1982. 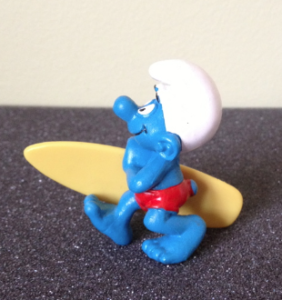 Surfer Smurf was released by Schleich between 1982 to 1994 and then again from 1998 to 2000. It was given article number #20137. 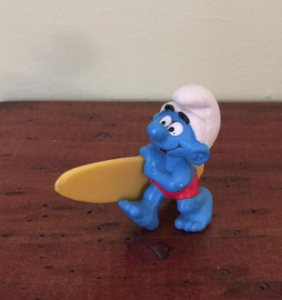 This version was made out of blue pvc material and the smurf carries a 6.2cm surfboard with a rounded tip. The markings on the smurf can be a little tricky to read as they are between his legs. There are no markings to be found on the surfboard. Surfer Smurf was also released by Wallace Berrie in 1982 in the United States. It was only sold for two years by Wallace Berrie but can be found with two different Hong Kong markings – W.B.CO. or W.Berrie Co. This version was made out of white pvc material and the smurf carries a 7cm surfboard with a rounded tip. The markings on the smurf can be found on it’s back and on the outside of the surfboard – Made in Hong Kong Schleich S © 1981 Peyo. When Surfer was re-released in 1998 Schleich made changes to it’s markings by adding a large thin CE marking to the smurf’s back and removing the W in front of Germany, but made no obvious changes to the smurf. With this version can be found with a 6.5cm long surfboard. I also have a Surfer that is extra special as it is painted in the most beautiful light blue colour and only has markings on the surfboard – Made in China © Peyo 1991 IMPS CE. I have not come across any other smurfs with this marking. In the book Der Schlumpf Katalog IV, published in 2003 we see a picture of a surfer carrying a red surfboard and yellow bathers. In the book they refer to as a test version. The surfboard is identical to the yellow board just painted red instead. Like many other smurfs this is on my ‘most wanted’ list. So if you have a favourite smurf that you would like us to discuss in 2019 or have any suggestions/feedback for any posts just send us a message. 2019 is going to be a big year as it marks the 40th anniversary of when smurf mania hit Australian shores, stay tuned. Yes, that sounds about right. If it has the markings are © 81 Peyo W.Germany and they are between the legs, it sounds like you have the first version released. Great to hear of your discovery!